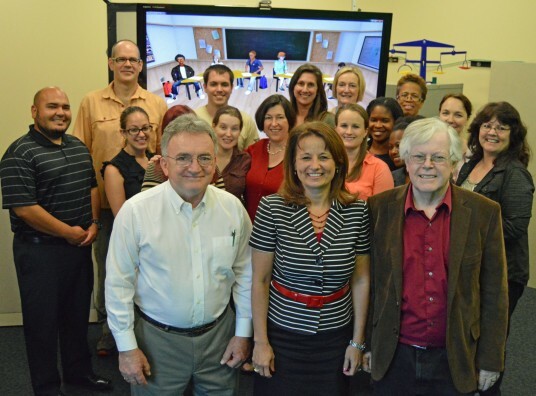 TLE TeachLivE was created by an interdisciplinary team led by UCF professors Mike Hynes, Lisa Dieker and Charles Hughes. A team of more than 25 now supports the technology, development and partnerships of the award-winning classroom simulation software. Imagine stepping in front of a classroom full of high schoolers for the first time to teach a math lesson. You’re trying to calm your nerves and deliver content clearly and compellingly when you catch C.J. in the back row texting on her cell phone. Sean, another student, interrupts your pre-calculus lesson to tell you about a TV show he watched the night before. Suddenly, you’ve lost your place entirely. It is a scenario that’s typical for teachers, but thanks to an innovative teacher preparation tool developed at the University of Central Florida, it is something that practicing teachers and teachers-in-training can work through without impacting any actual students. That’s because C.J., Sean and their classmates are avatars in a virtual classroom. The program, called TLE TeachLivE™ is a mixed-reality simulation environment that provides users the opportunity to practice a targeted skill, whether classroom management or content pedagogy. Similar simulation technologies are common in medicine and aviation, but TeachLivE is the only one of its kind in education, providing a personalized learning environment customized to the unique needs of teachers-in-training or practicing teachers looking to brush up on their skills or try out new techniques. Hynes created TeachLivEwith education professor Lisa Dieker, College of Engineering & Computer Science professor Charles Hughes, and an interdisciplinary team that included members of the Synthetic Reality Lab at UCF’s Institute for Simulation & Training. Last month, TeachLivE took the top prize at the NewSchools Venture Fund’s annual summit. The Learning to Teach Impact Award is given annually to a teacher-preparation program that connects teachers with opportunities for practice in real-world settings. In 2013, TeachLivE earned the 2013 Governor’s Award for Excellence in Modeling and Simulation from the National Training and Simulation Association, an honor that’s typically awarded to military applications of modeling and simulation. The TeachLivE concept began more than eight years ago. Today, TeachLivE is delivered to more than 10,000 teachers at 37 partner universities and at other sites including the school districts in Orange, Seminole, Lake and Volusia counties. A team of more than 25 at UCF supports the technology, development and partnerships. The current version of TeachLivE requires only a typical computer, a large display and a Microsoft Kinect to allow users to move about the environment and have “natural” interactions with the avatars. The TLE TeachLivE team says the “sandbox” nature of the program—its ability to be used in different ways and for different purposes—could also have uses in areas outside of education. Up next for the TeachLivE team is the program’s second annual conference, which will be held at UCF May 22-23. The conference will include presentations by institutions that use TeachLivE with opportunities to share teaching and research ideas. Actress Cheryl Hines, a UCF alumna, will kick off the conference Thursday at 3:45 p.m. in the Morgridge International Reading Center with a keynote presentation about improvisation. Other conference sessions will focus on how “virtual rehearsal” can be used to curb teacher anxieties, train counselors and prepare early childhood educators. Additional information about the conference and the simulation software is available at http://sreal.eecs.ucf.edu/teachlive/.